It's been a busy fall semester for our musicians. Mahalia Dean, Kaylee Kelleher, Sara Powell and Julia Ussailis played with Franklin County Honor Band. Kaylee Kelleher and Mahalia Dean are also members of the Pioneer Valley Youth Orchestra. Singers Wyatt Bandy-Page, Sara Paige and Matthew Taylor were accepted to the Western District Festival Chorus. Matt Taylor will have the honor of joining the All Eastern Mixed Chorus next spring in Atlantic City, New Jersey - quite an achievement! Congratulations to all on their accomplishments this year! On Wednesday evening December 14, Select Chorus sang for the School Committee on their way to a performance for the Shelburne Falls Womens Club. 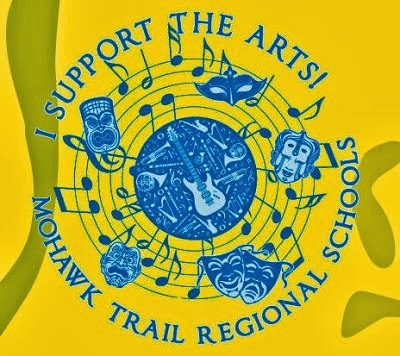 Finally, the Winter Concert on December 8 was a success and we'd like to thank everyone in the Mohawk community for their wonderful support of the music program.